Aedan Using was the leading scorer with 21 points against Hale Ray last night. Old Lyme notched another victory last night at Hale Ray winning by 66 points to 47, leaving them undefeated in the Shoreline Conference. 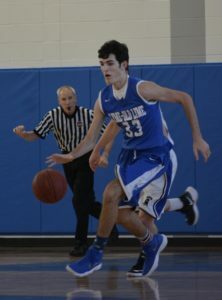 The Wildcats were led by junior Aedan Using, who scored 21 points and 11 rebounds. Connor Hogan chipped in with 12. The Wildcats are now 15-1 overall and 15-0 in the Shoreline Conference.